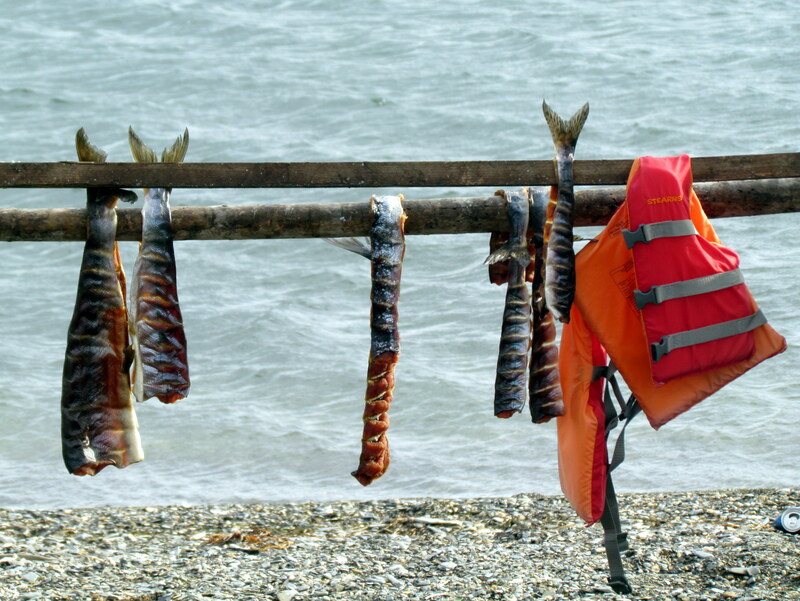 Get to Nome by air, sea, or Iditarod – the 1100 mile dogsled race that begins in Anchorage. Mare and I take the slow ferry to Juneau, a pleasant ride through the inside passage and past whales. The following day, two flights later we will land in Nome. For now, we cannot wait for the luxury of a hotel room. Not so fast…The Alaskan Hotel in Juneau proves a flophouse for junkies and alcoholics. “Come look at my brother,” says a long-haired,bearded man with a strong accent. He stands on the paisley lined hallway and opens the door to a dingy room. I spot two young guys without shirts, lying perpendicular on a small bed, snoring. “Nice, are you from Russia?” What else can I say? “No, Poland!” He grabs one of many half-full bottles of vodka strewn about the room amidst some small pipes. “Nastrovia!” He gulps from the bottle and tries to hand it to me. “No thanks.” I continue down the hallway to the shared bathroom. Drunks revel outside our window and in adjacent rooms until three o’clock in the morning. My pillow is as flat as a communion wafer. Mare tries to keep the blankets away from her face. Suddenly we miss our primitive cabin in the woods. The airplane seats begin at aisle 16…with a wall dividing the front of the plane for cargo and the back for passengers. We soar above over massive glaciers that snake around mountains like frozen rivers. We find our elusive luxury at the Aurora Inn in Nome. Splurge! Sit on a couch, after living for four months on a picnic table and plastic chairs…plop on a big bed with fluffy pillows…got some catching up to do. We moan in ecstasy and haven’t even gone into the bedroom yet. Outside of our bay window, clouds and rain enhance the whitecaps of a black-green Bering Sea. We break into a celebratory dance. I can see Russia from my house…not really. Still, we cannot stop from staring at the sea. We force ourselves to leave this comfort in search of food and drink. We roam around Nome and notice weather-beaten dwellings with evidence of sustenance living decorating the yards. Hunting, fishing and gold panning all require four-wheel drive vehicles. 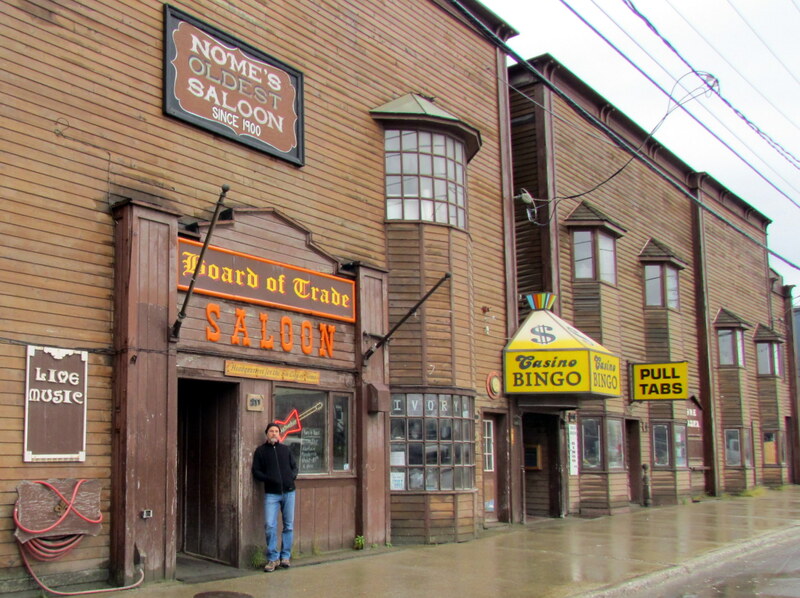 Nome has few restaurants, but many smoke-filled bars. A number of natives from the three Eskimo cultural groups stagger down the streets in an alcoholic haze. We cop a pizza topped with reindeer, and a six-pack to bring back to our heavenly room. I mean, we have a kitchen, lights, and a flushing toilet to enjoy. We revel for reaching the end of the westernmost road on the North American Continent, only 12 miles from Russia’s Big Diomede Island. The drive takes us back down the slippery silicone road where maroon, yellow and orange colors blanket the spongy tundra. Snow and ice will cover this carpet for the next nine months. Our expectations of spotting herds of Musk Oxen, Reindeer and Caribou will have to wait. 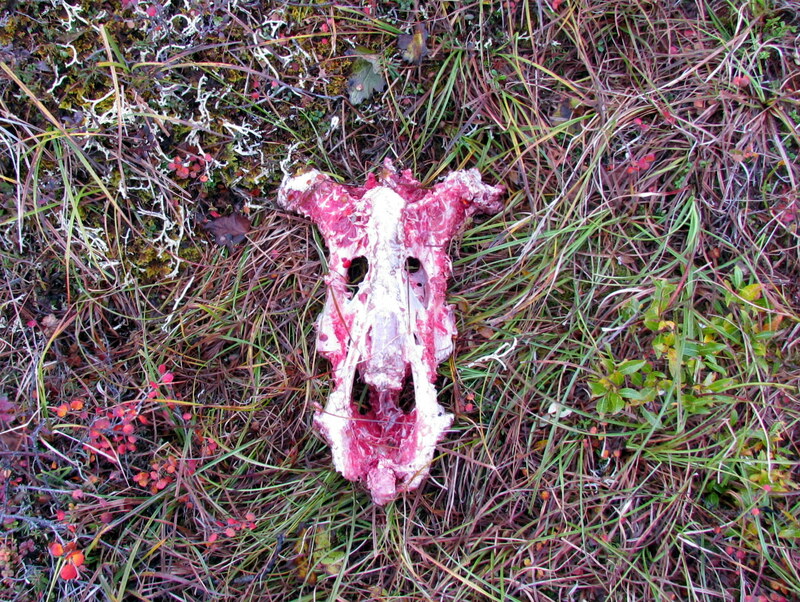 We do, however, spot a skinned Musk Oxen, pummeled and picked apart by predators. We chase away the scavenging birds from the dead animal’s skull, which just happens to compliment a beautiful bouquet of tundra colors. another grand adventure! oh my that hotel in Juneau sounds SEEDY! Gorgeous shot of the tundra…. oh glad you like the tea! sorry I’ll miss you when you swing back south! We are learning quickly how much Poles love their Vodka as well! Nothing new here, except more “HEAT”..BUT…”they” say that next week will be below 100!! Continue the great writings and photos! Thanks, Skip. We miss you too, man.